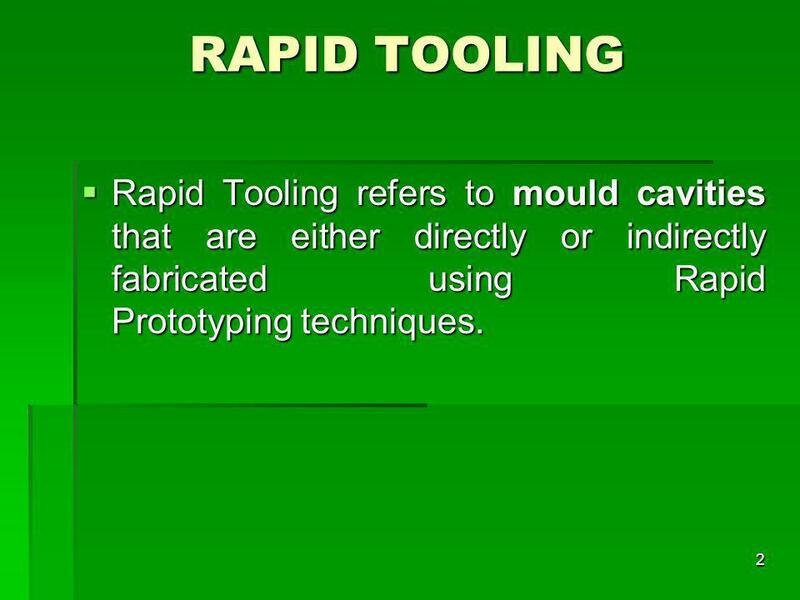 2 RAPID TOOLING Rapid Tooling refers to mould cavities that are either directly or indirectly fabricated using Rapid Prototyping techniques. 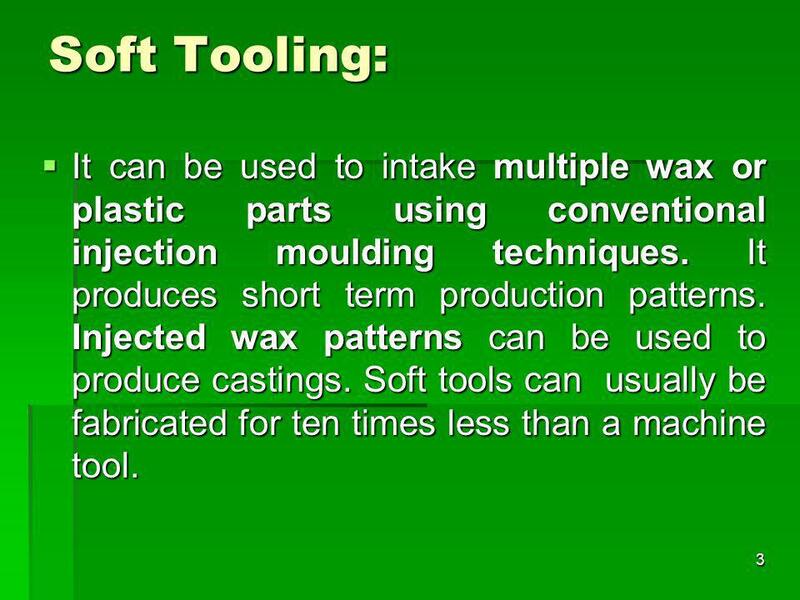 3 Soft Tooling: It can be used to intake multiple wax or plastic parts using conventional injection moulding techniques. It produces short term production patterns. Injected wax patterns can be used to produce castings. Soft tools can usually be fabricated for ten times less than a machine tool. 4 Hard Tooling: Patterns are fabricated by machining either tool steel or aluminum into the negative shape of the desired component. Steel tools are very expensive yet typically last indefinitely building millions of parts in a mass production environment. 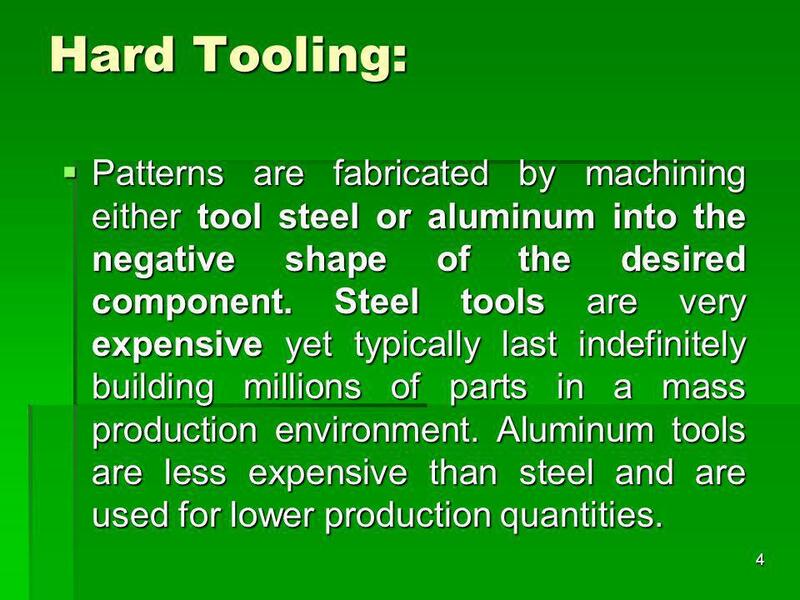 Aluminum tools are less expensive than steel and are used for lower production quantities. As RP is becoming more mature, material properties, accuracy, cost and lead time are improving to permitting to be employed for production of tools. 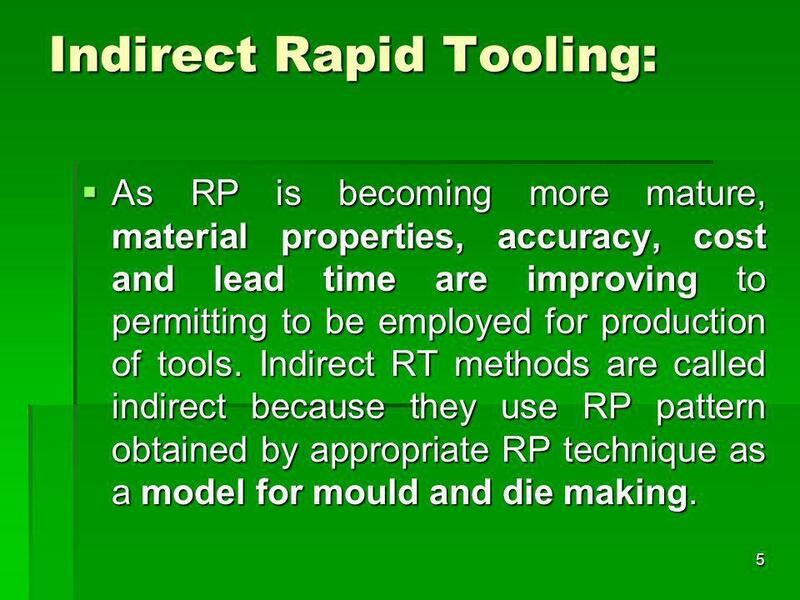 Indirect RT methods are called indirect because they use RP pattern obtained by appropriate RP technique as a model for mould and die making. 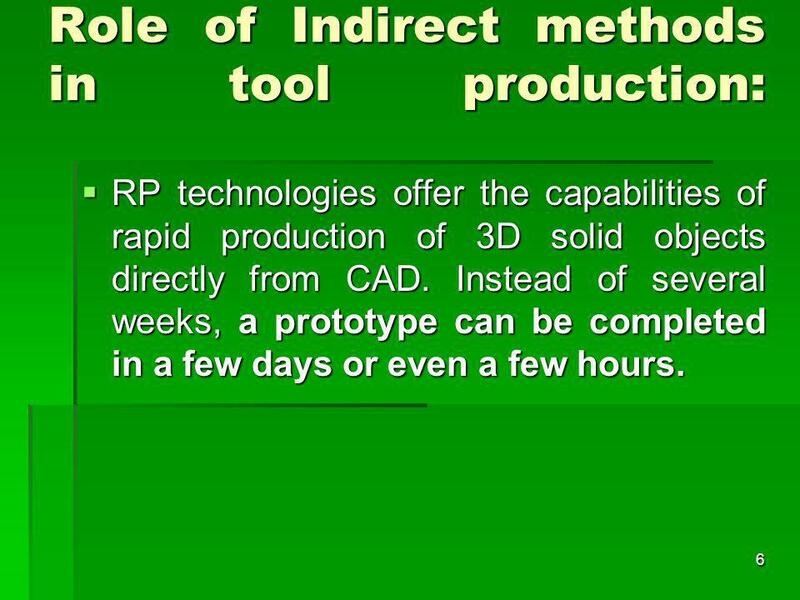 RP technologies offer the capabilities of rapid production of 3D solid objects directly from CAD. Instead of several weeks, a prototype can be completed in a few days or even a few hours. 7 Unfortunately with RP techniques, there is only a limited range of materials from which prototypes can be made. 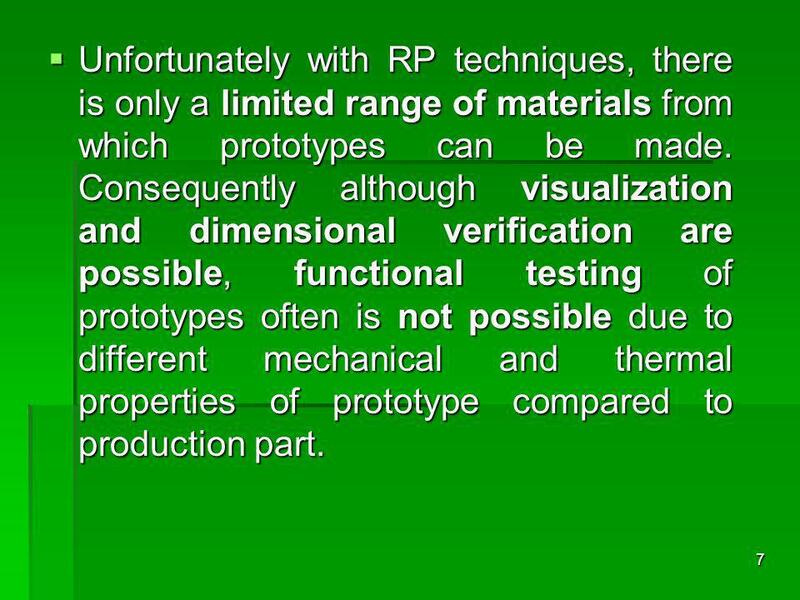 Consequently although visualization and dimensional verification are possible, functional testing of prototypes often is not possible due to different mechanical and thermal properties of prototype compared to production part. 8 All this leads to the next step which is for RP industry to target tooling as a natural way to capitalize on 3D CAD modeling and RP technology. 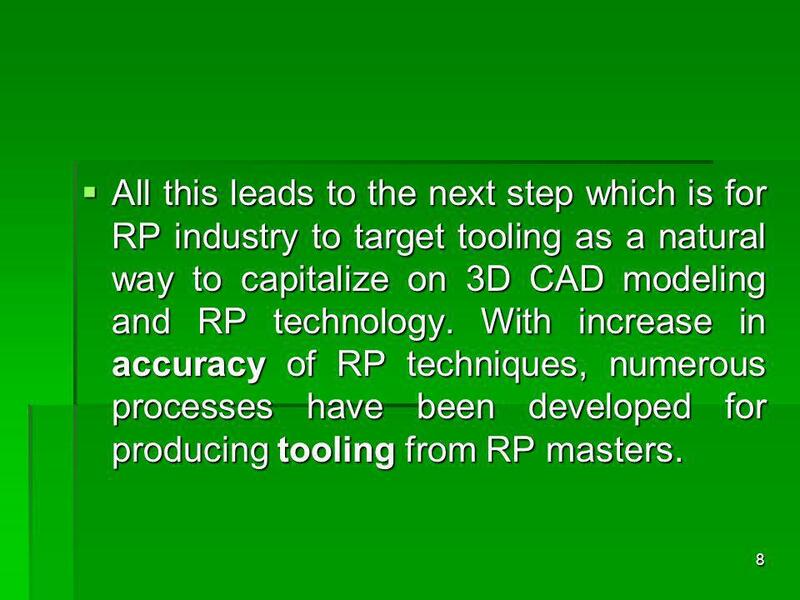 With increase in accuracy of RP techniques, numerous processes have been developed for producing tooling from RP masters. 9 The most widely used indirect RT methods are to use RP masters to make silicon room temperature vulcanizing moulds for plastic parts and as sacrificial models or investment casting of metal parts. These processes are usually known as Soft Tooling Techniques. It is a soft tooling technique. 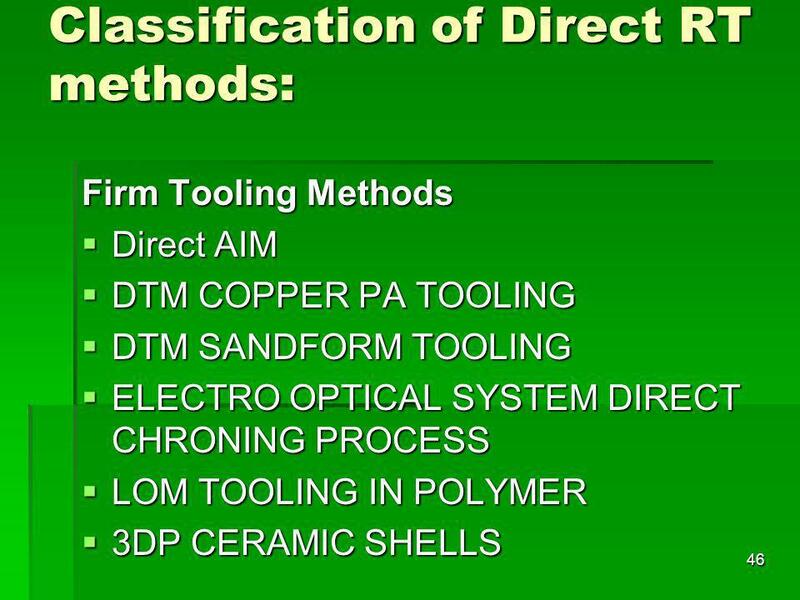 It is a indirect rapid tooling method. 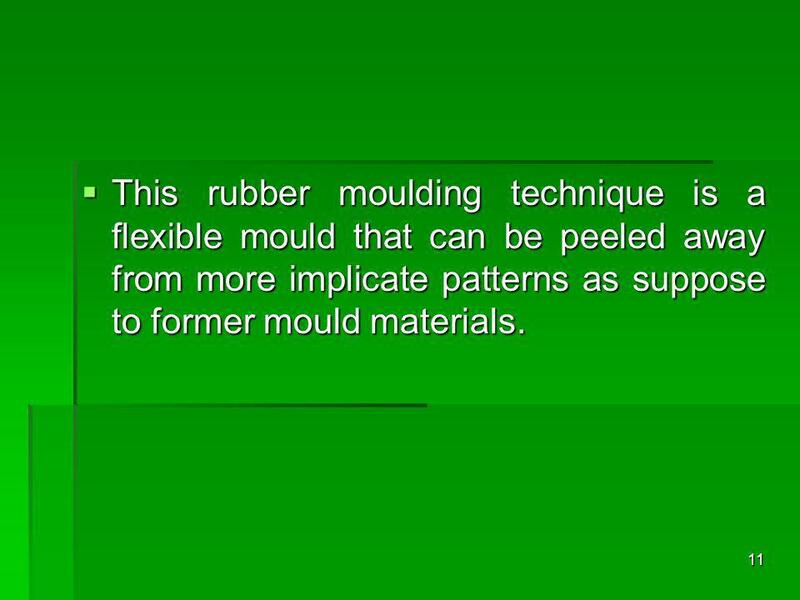 Another root for soft tooling is to use RP model as a pattern for silicon rubber mould which can then in turn be injected several times. Room Temperature Vulcanization Silicones are preferable as they do not require special curing equipment. 11 This rubber moulding technique is a flexible mould that can be peeled away from more implicate patterns as suppose to former mould materials. 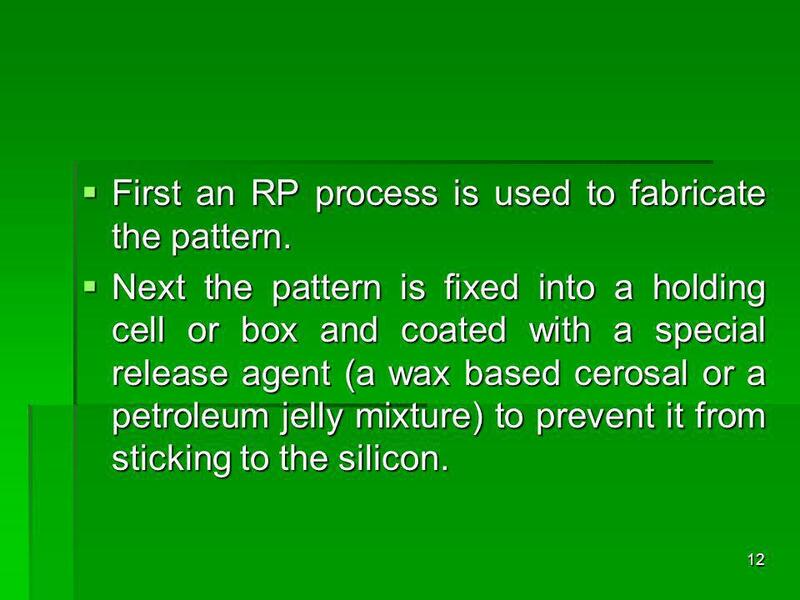 12 First an RP process is used to fabricate the pattern. Next the pattern is fixed into a holding cell or box and coated with a special release agent (a wax based cerosal or a petroleum jelly mixture) to prevent it from sticking to the silicon. 13 The silicon rubber typically in a two part mix is then blended, vacuumed to remove air packets and poured into the box around the pattern until the pattern is completely encapsulated. After the rubber is fully cured which usually takes 12 to 24 hours the box is removed and the mould is cut into two (not necessarily in halves) along a pre determined parting line. 14 At this point, the original pattern is pulled from the silicon mould which can be placed back together and repeatedly filled with hot wax or plastic to fabricate multiple patterns. These tools are generally not injected due to the soft nature of the material. Therefore the final part materials must be poured into the mould each cycle. 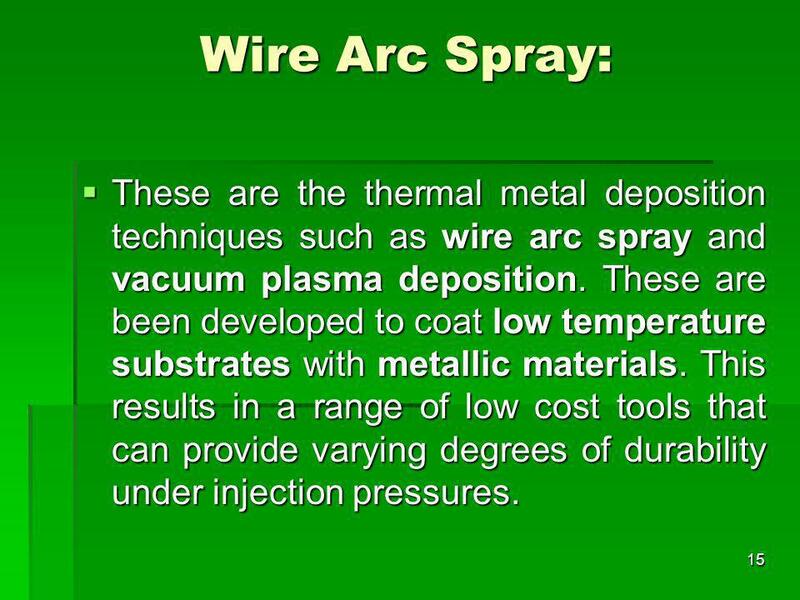 15 Wire Arc Spray: These are the thermal metal deposition techniques such as wire arc spray and vacuum plasma deposition. These are been developed to coat low temperature substrates with metallic materials. 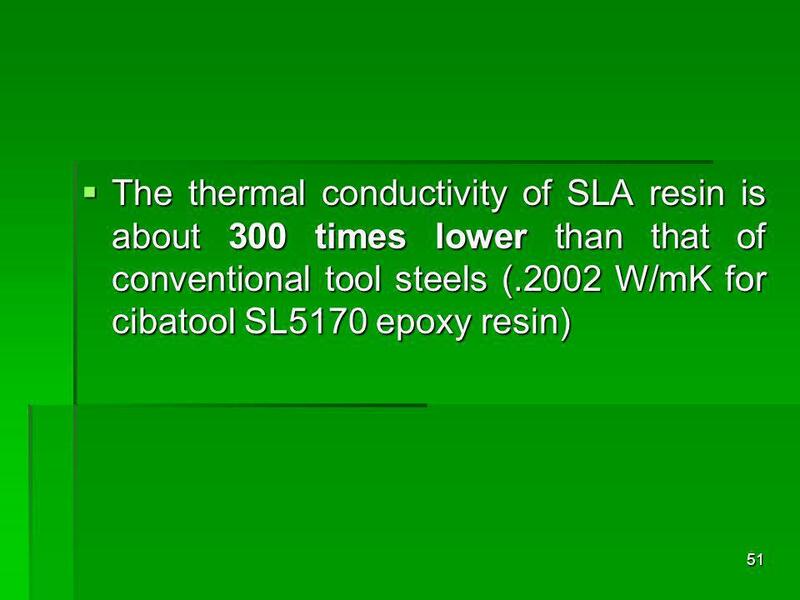 This results in a range of low cost tools that can provide varying degrees of durability under injection pressures. 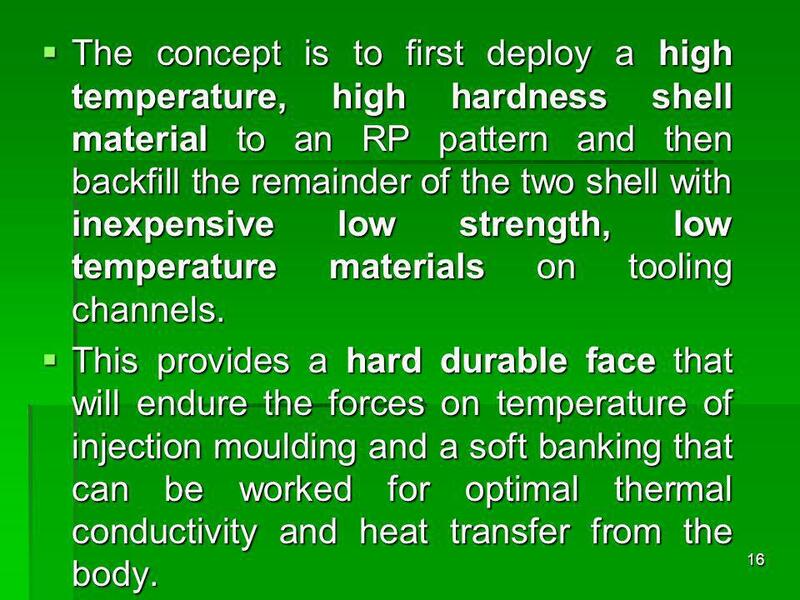 16 The concept is to first deploy a high temperature, high hardness shell material to an RP pattern and then backfill the remainder of the two shell with inexpensive low strength, low temperature materials on tooling channels. This provides a hard durable face that will endure the forces on temperature of injection moulding and a soft banking that can be worked for optimal thermal conductivity and heat transfer from the body. 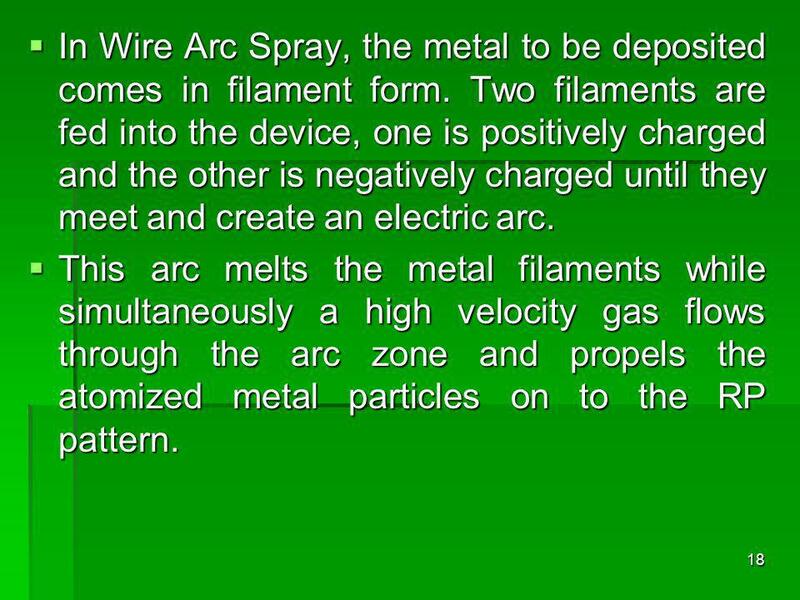 In Wire Arc Spray, the metal to be deposited comes in filament form. 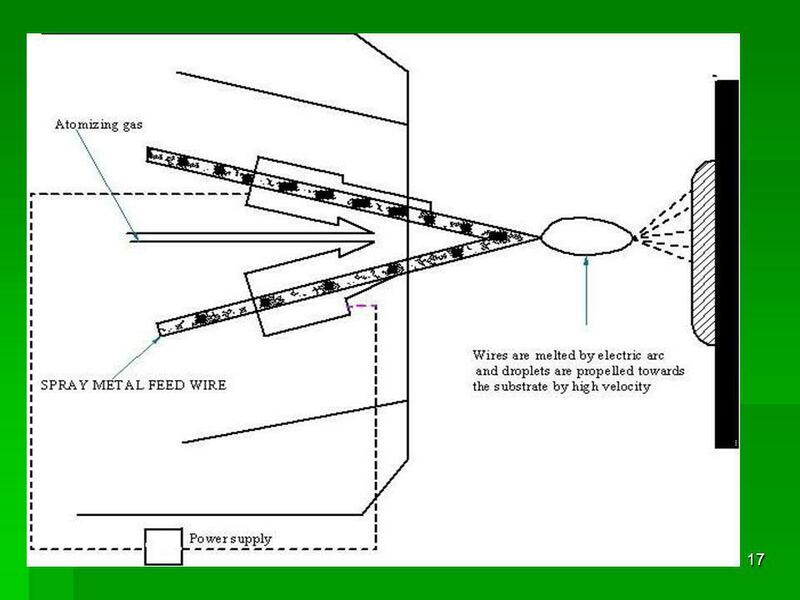 Two filaments are fed into the device, one is positively charged and the other is negatively charged until they meet and create an electric arc. This arc melts the metal filaments while simultaneously a high velocity gas flows through the arc zone and propels the atomized metal particles on to the RP pattern. 19 The spray pattern is either controlled manually or automatically by robotic control. Metal can be applied in successive thin coats to very low temperature of RP patterns without deformation of geometry. 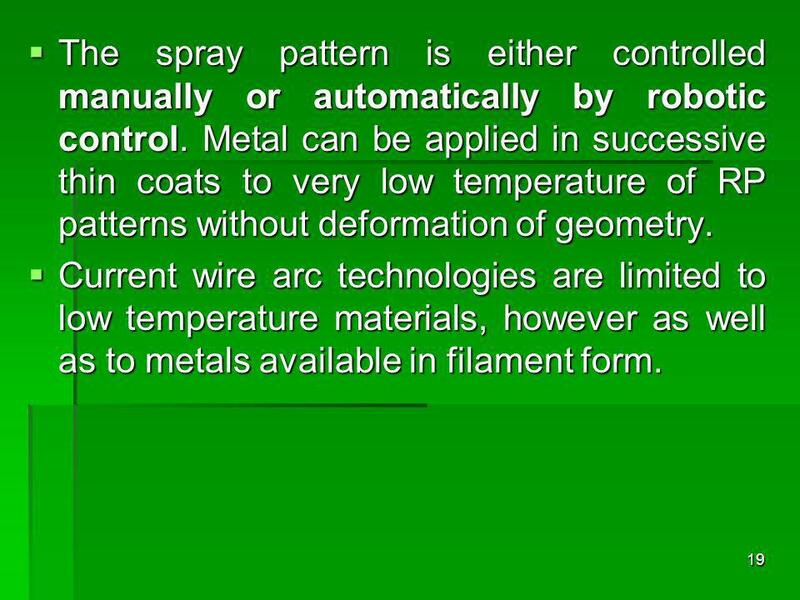 Current wire arc technologies are limited to low temperature materials, however as well as to metals available in filament form. 20 Vacuum Plasma Spray technologies are more suited in higher melting temperature metals. 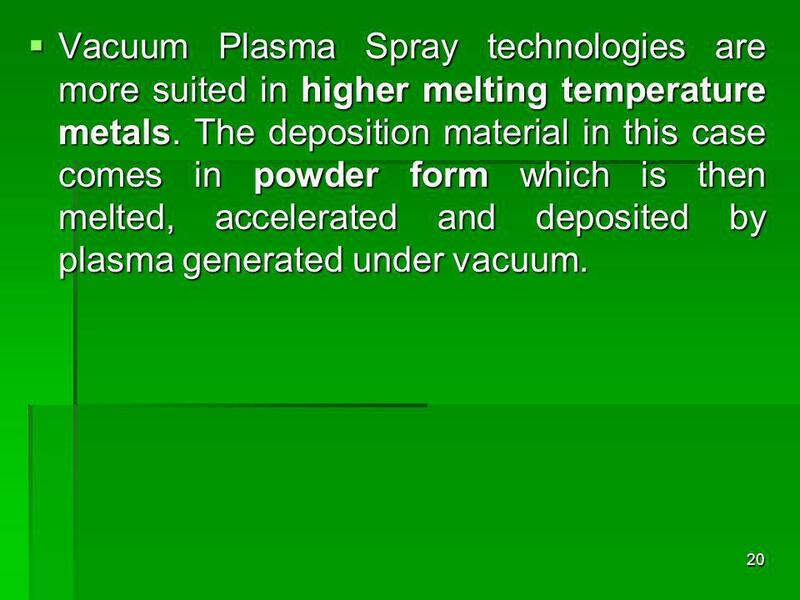 The deposition material in this case comes in powder form which is then melted, accelerated and deposited by plasma generated under vacuum. 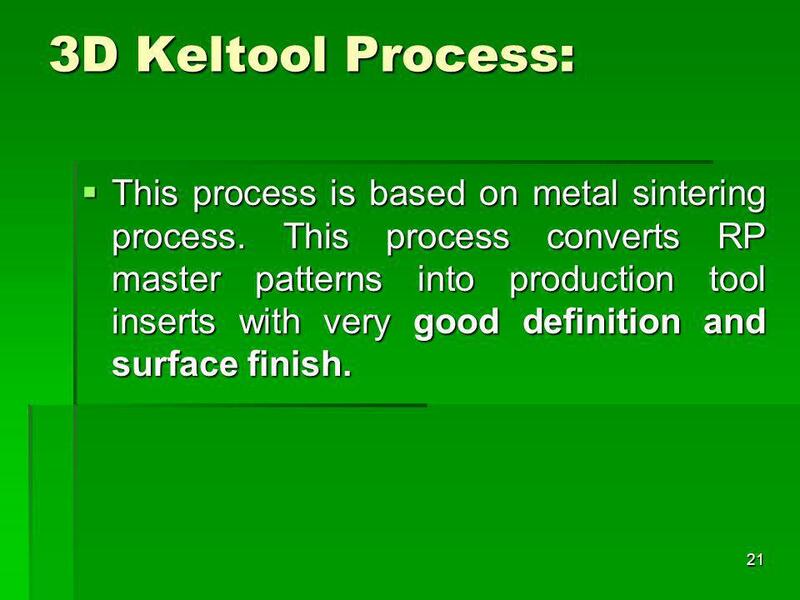 21 3D Keltool Process: This process is based on metal sintering process. This process converts RP master patterns into production tool inserts with very good definition and surface finish. 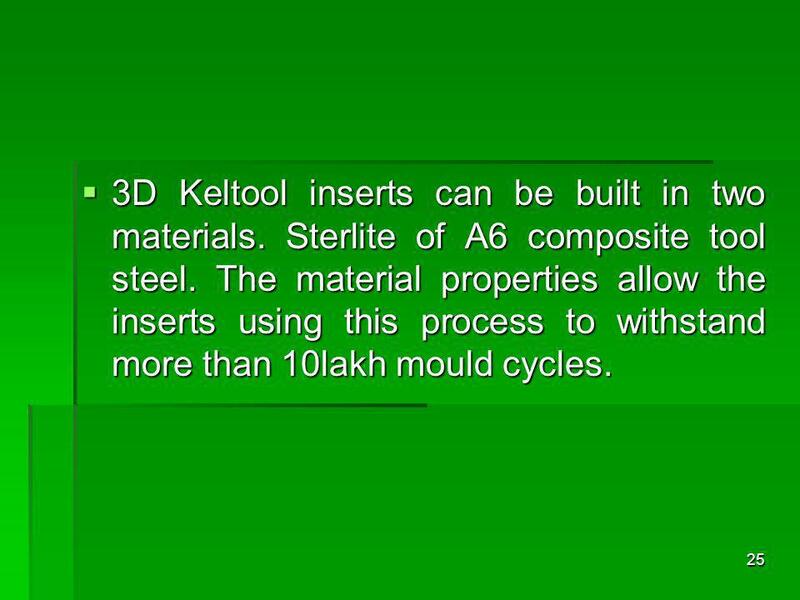 22 The production of inserts including the 3D Keltool process involves the following steps. Fabricating the master patterns of core and cavity. Producing RTV silicon rubber mould from the pattern. 23 Filling the silicon rubber mould with metal mixtures to produce green parts duplicating the masters. Metal mixture is powdered steel, tungsten carbide and polymer binder with particle sizes of around 5 nm. Green parts are powdered metal held together by polymer binder. 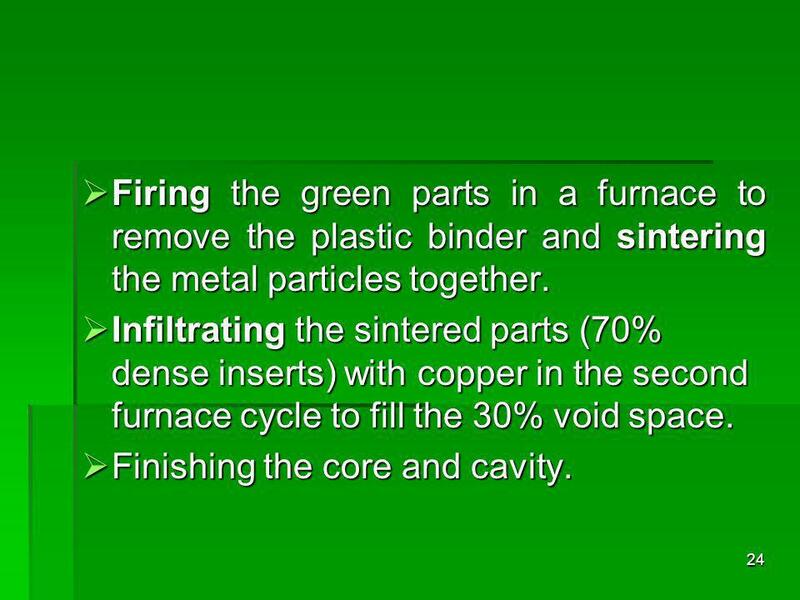 24 Firing the green parts in a furnace to remove the plastic binder and sintering the metal particles together. Infiltrating the sintered parts (70% dense inserts) with copper in the second furnace cycle to fill the 30% void space. Finishing the core and cavity. 3D Keltool inserts can be built in two materials. Sterlite of A6 composite tool steel. The material properties allow the inserts using this process to withstand more than 10lakh mould cycles. 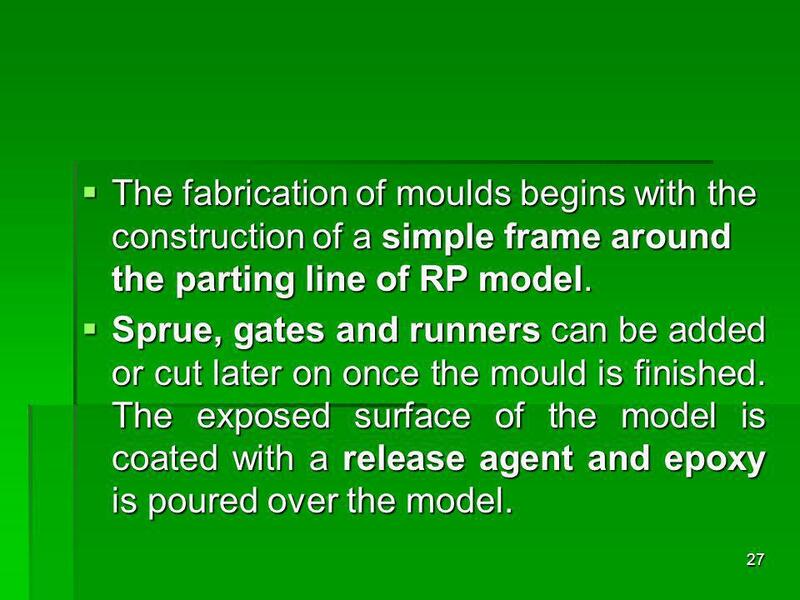 27 The fabrication of moulds begins with the construction of a simple frame around the parting line of RP model. Sprue, gates and runners can be added or cut later on once the mould is finished. The exposed surface of the model is coated with a release agent and epoxy is poured over the model. 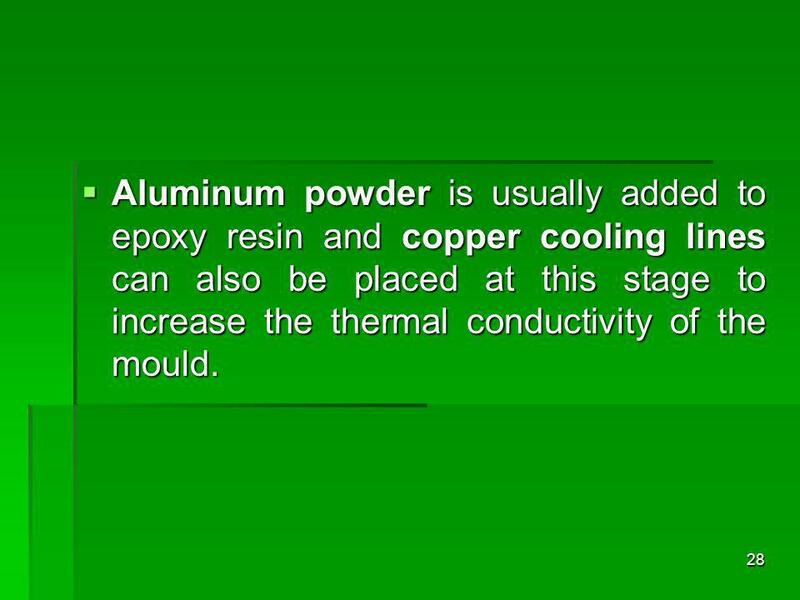 28 Aluminum powder is usually added to epoxy resin and copper cooling lines can also be placed at this stage to increase the thermal conductivity of the mould. 29 Once the epoxy is cured the assembly is inverted and the parting line block is removed leaving the pattern embedded in the side of the tool just cast. Another frame is constructed and epoxy is poured to form the other side of the tool. Then the second side of the tool is cured. 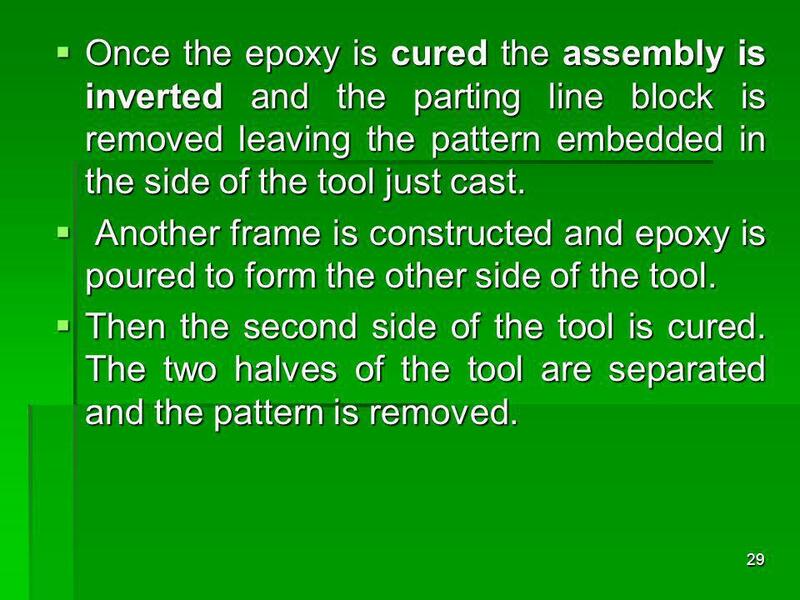 The two halves of the tool are separated and the pattern is removed. 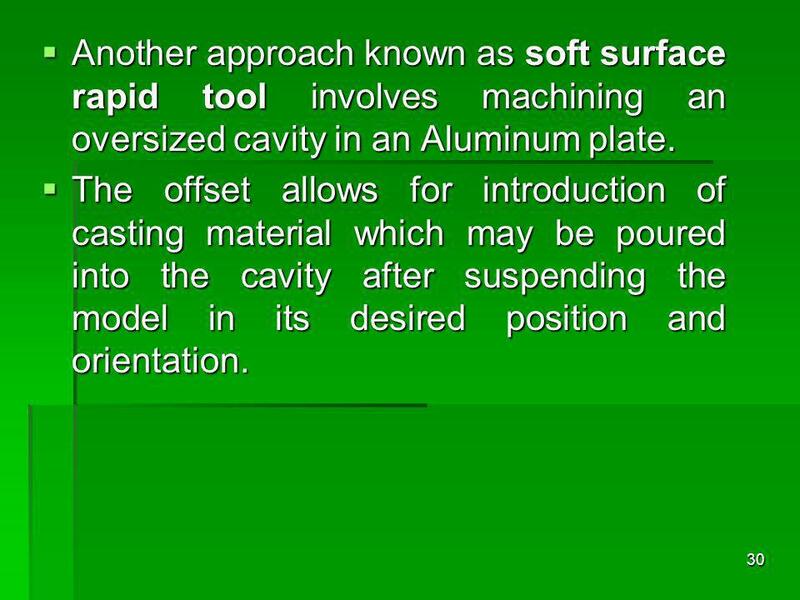 30 Another approach known as soft surface rapid tool involves machining an oversized cavity in an Aluminum plate. The offset allows for introduction of casting material which may be poured into the cavity after suspending the model in its desired position and orientation. 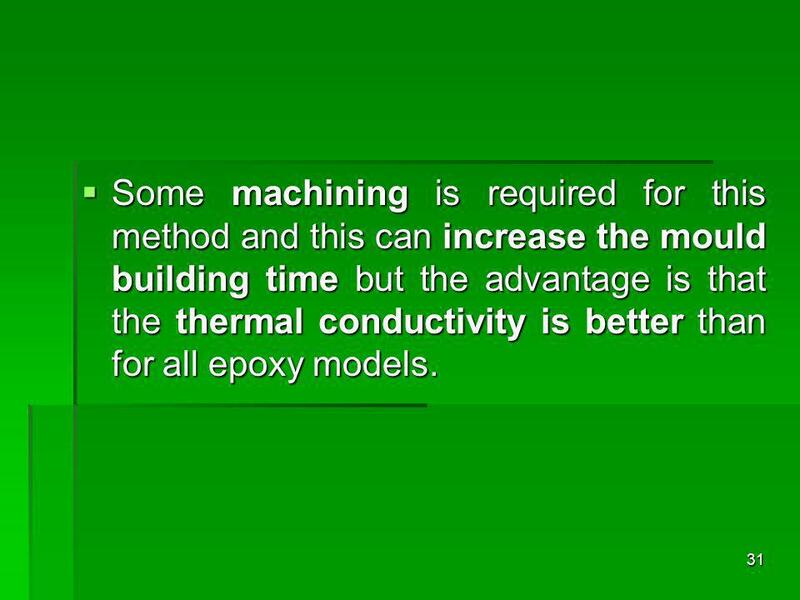 31 Some machining is required for this method and this can increase the mould building time but the advantage is that the thermal conductivity is better than for all epoxy models. 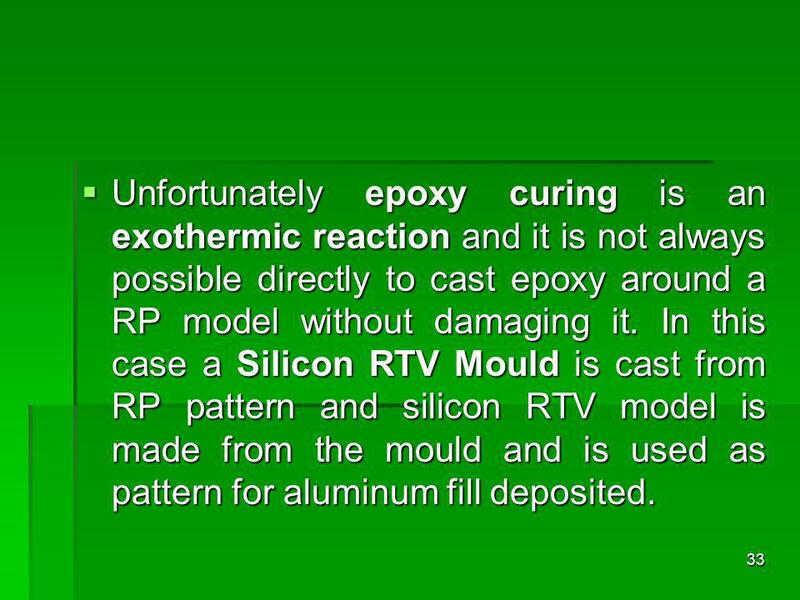 33 Unfortunately epoxy curing is an exothermic reaction and it is not always possible directly to cast epoxy around a RP model without damaging it. 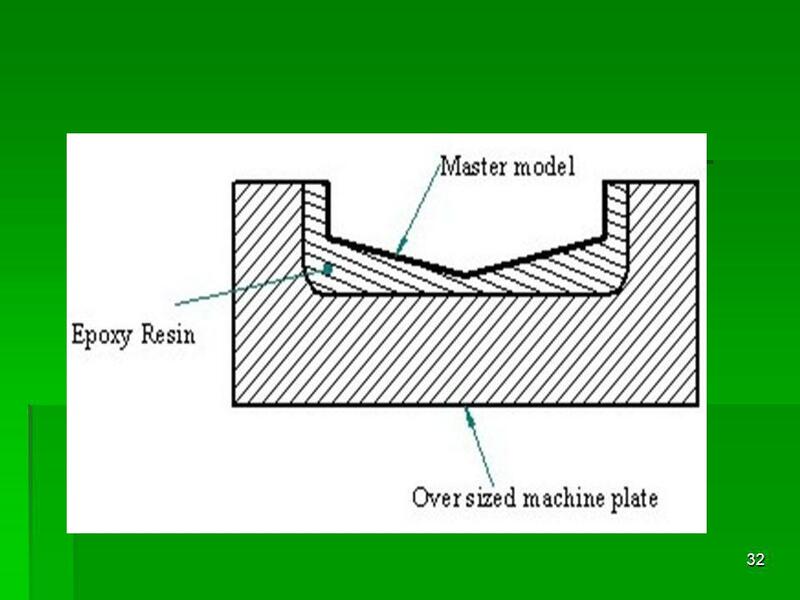 In this case a Silicon RTV Mould is cast from RP pattern and silicon RTV model is made from the mould and is used as pattern for aluminum fill deposited. A loss of accuracy occurs during this succession of reproduction steps. 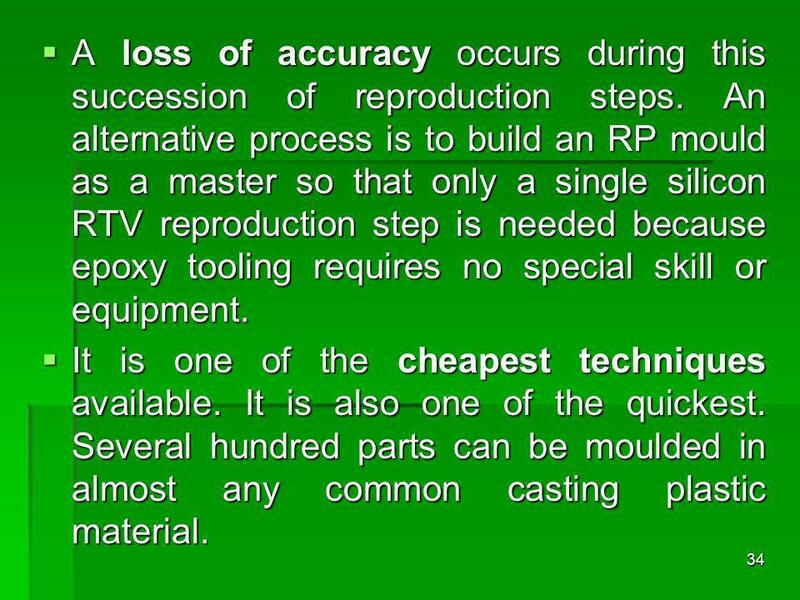 An alternative process is to build an RP mould as a master so that only a single silicon RTV reproduction step is needed because epoxy tooling requires no special skill or equipment. It is one of the cheapest techniques available. It is also one of the quickest. Several hundred parts can be moulded in almost any common casting plastic material. 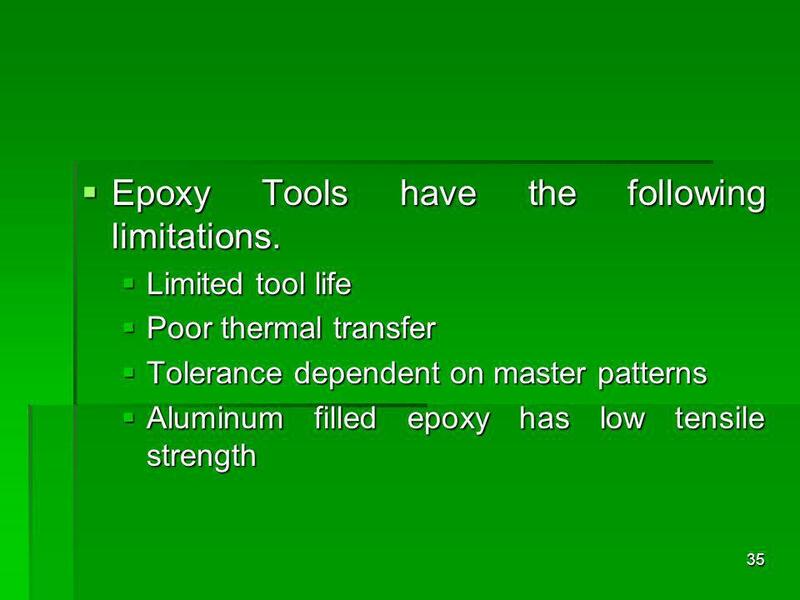 35 Epoxy Tools have the following limitations. 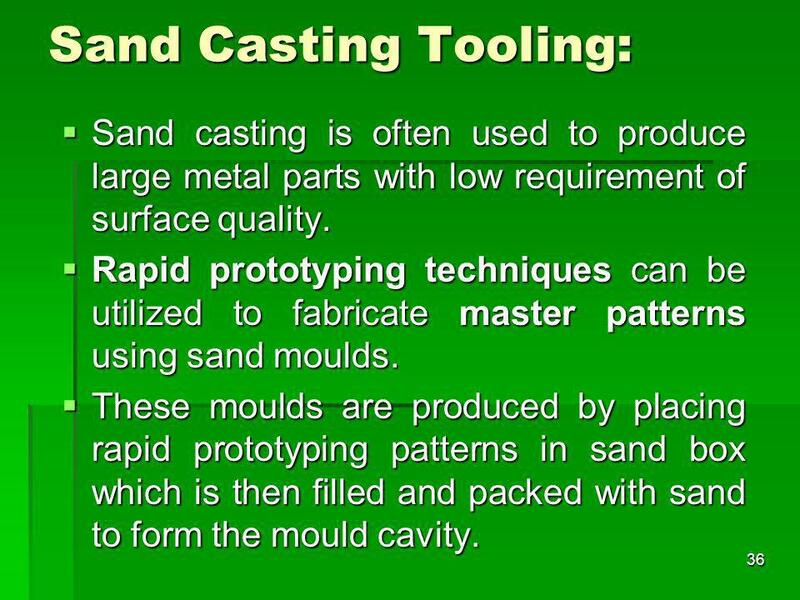 36 Sand Casting Tooling: Sand casting is often used to produce large metal parts with low requirement of surface quality. Rapid prototyping techniques can be utilized to fabricate master patterns using sand moulds. These moulds are produced by placing rapid prototyping patterns in sand box which is then filled and packed with sand to form the mould cavity. 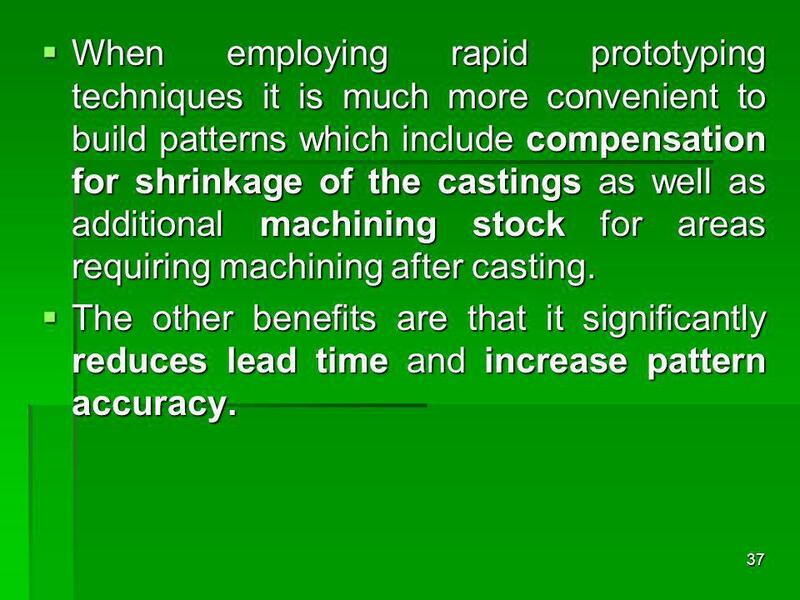 37 When employing rapid prototyping techniques it is much more convenient to build patterns which include compensation for shrinkage of the castings as well as additional machining stock for areas requiring machining after casting. The other benefits are that it significantly reduces lead time and increase pattern accuracy. 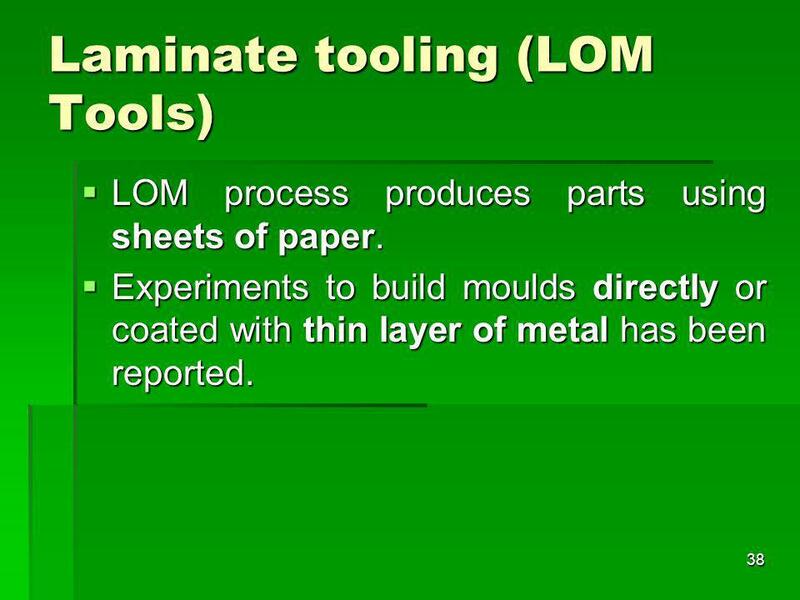 LOM process produces parts using sheets of paper. Experiments to build moulds directly or coated with thin layer of metal has been reported. 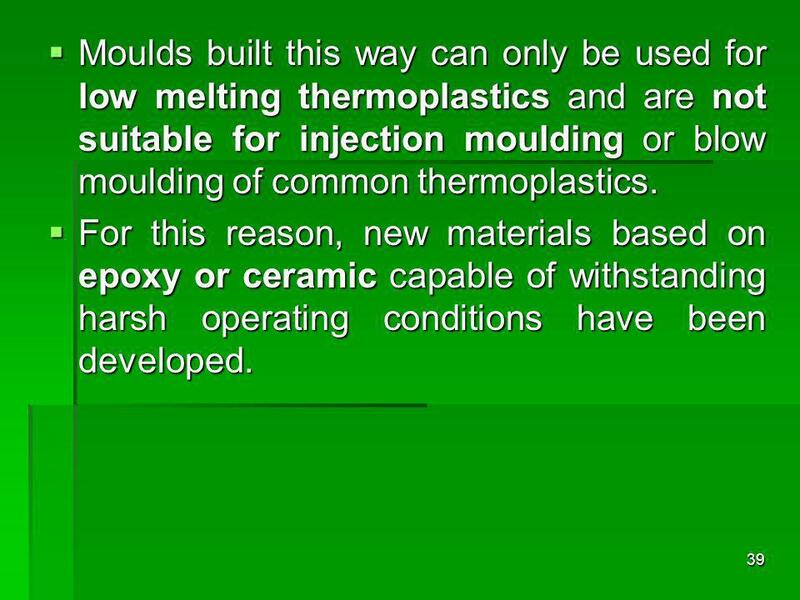 39 Moulds built this way can only be used for low melting thermoplastics and are not suitable for injection moulding or blow moulding of common thermoplastics. For this reason, new materials based on epoxy or ceramic capable of withstanding harsh operating conditions have been developed. 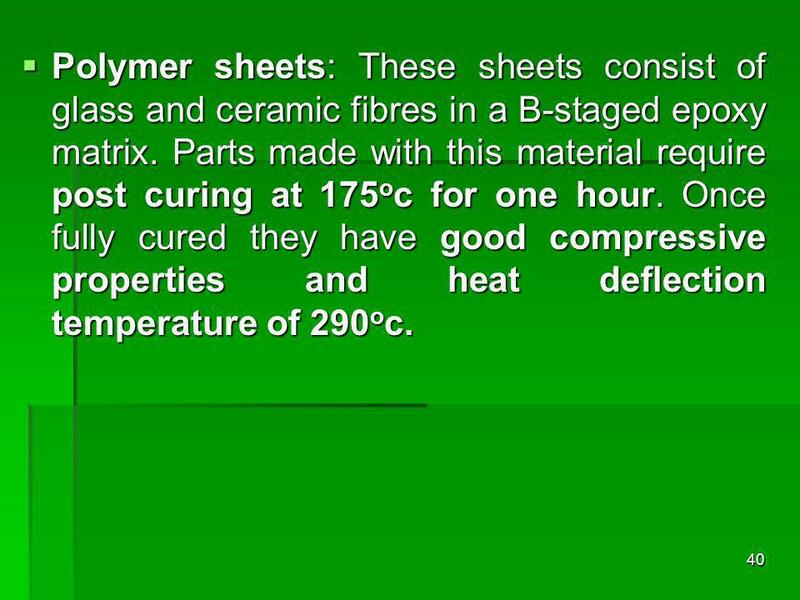 40 Polymer sheets: These sheets consist of glass and ceramic fibres in a B-staged epoxy matrix. Parts made with this material require post curing at 175oc for one hour. Once fully cured they have good compressive properties and heat deflection temperature of 290oc. 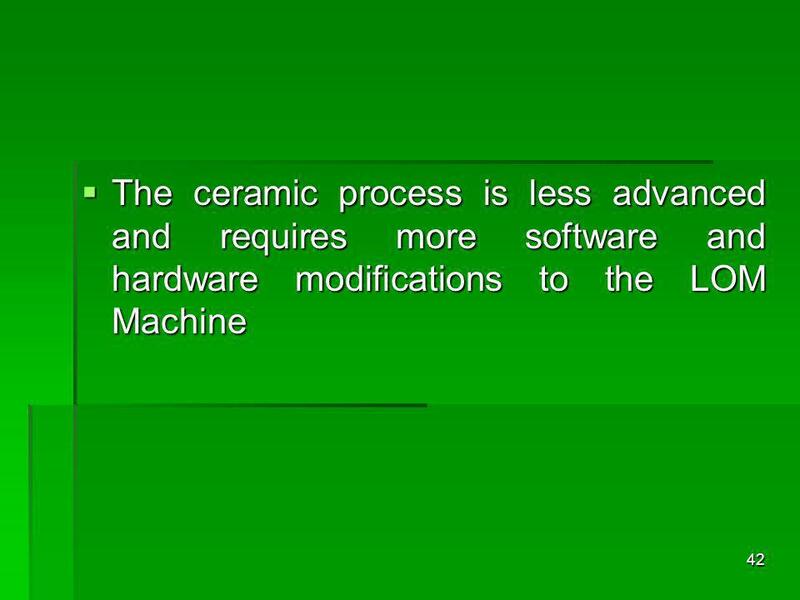 41 Ceramic sheets: Two ceramic materials have been developed for LOM, a sinterable AIN ceramic and a silicon infiltrable SiC ceramic. Both materials are mixed with 55% by volume of polymeric binder. 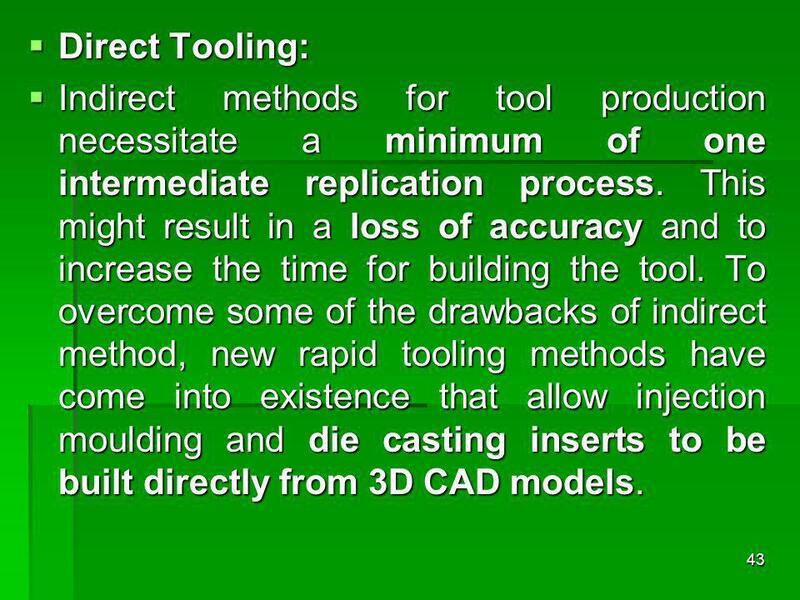 43 Direct Tooling: Indirect methods for tool production necessitate a minimum of one intermediate replication process. This might result in a loss of accuracy and to increase the time for building the tool. To overcome some of the drawbacks of indirect method, new rapid tooling methods have come into existence that allow injection moulding and die casting inserts to be built directly from 3D CAD models. Direct Rapid Tooling Processes can be divided into two main groups 1st group: It includes less expensive methods with shorter lead times. 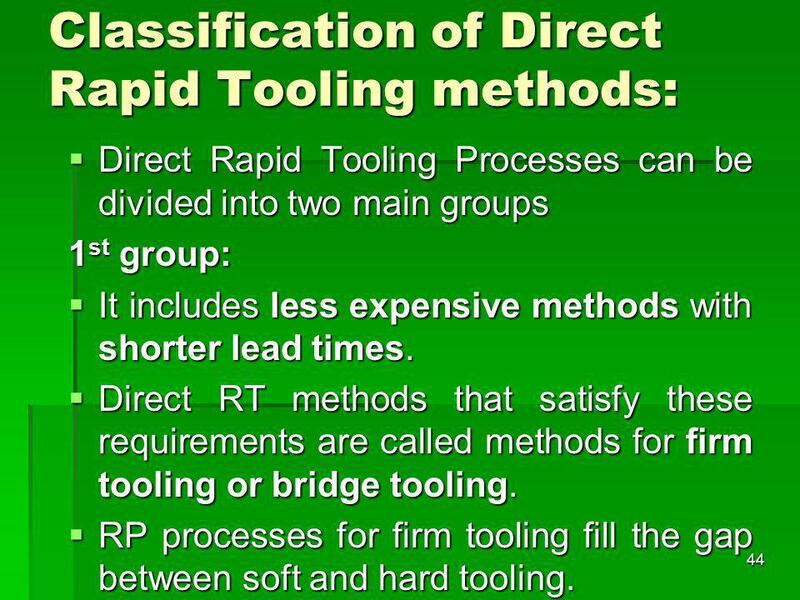 Direct RT methods that satisfy these requirements are called methods for firm tooling or bridge tooling. 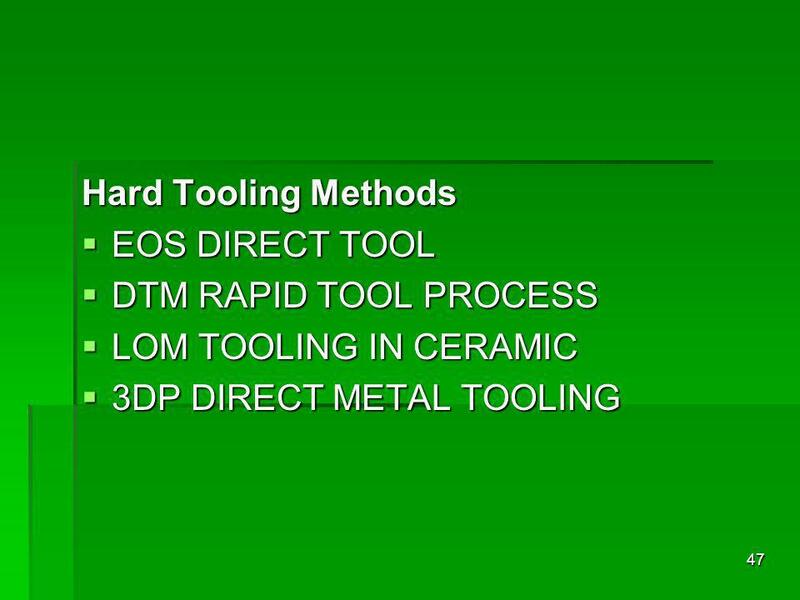 RP processes for firm tooling fill the gap between soft and hard tooling. 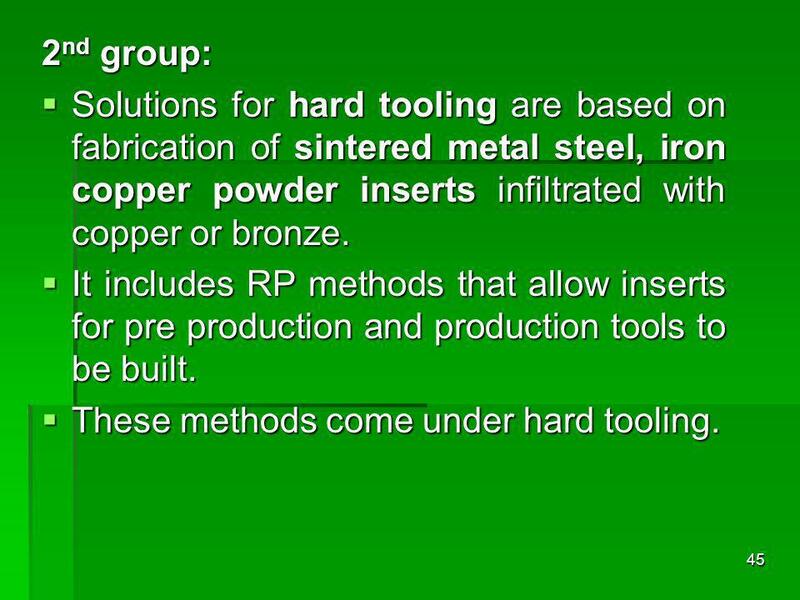 45 2nd group: Solutions for hard tooling are based on fabrication of sintered metal steel, iron copper powder inserts infiltrated with copper or bronze. It includes RP methods that allow inserts for pre production and production tools to be built. These methods come under hard tooling. 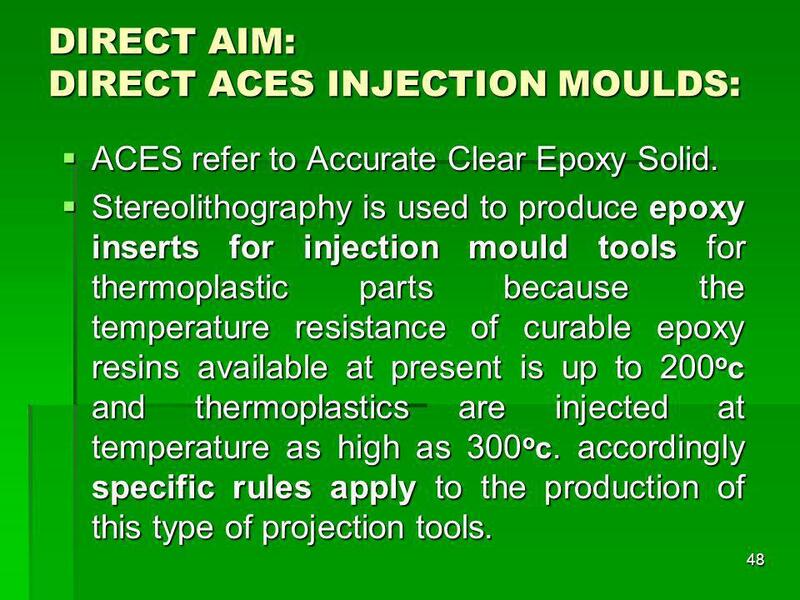 ACES refer to Accurate Clear Epoxy Solid. Stereolithography is used to produce epoxy inserts for injection mould tools for thermoplastic parts because the temperature resistance of curable epoxy resins available at present is up to 200oc and thermoplastics are injected at temperature as high as 300oc. 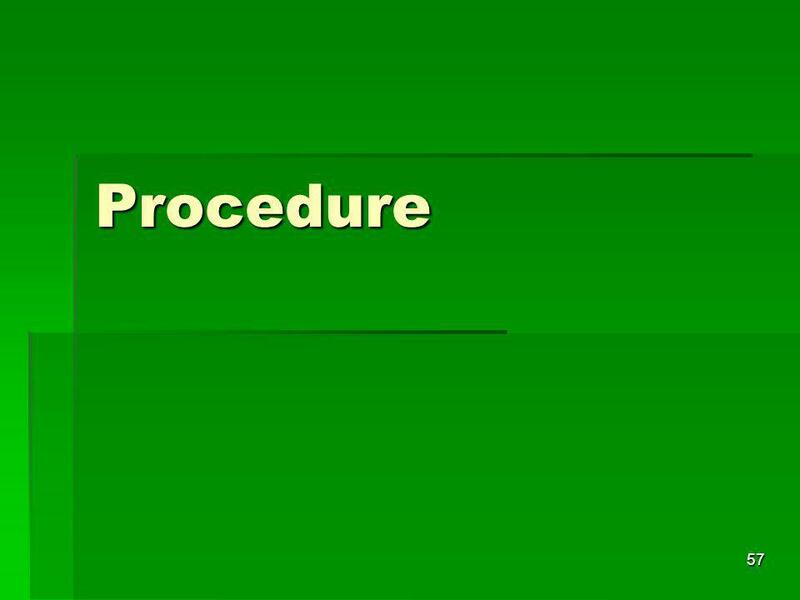 accordingly specific rules apply to the production of this type of projection tools. 50 Using a 3D CAD package, the injection mould is drawn. Runners, gates, ejector pins and clearance holes are added and mould is shelled to a recommended thickness of 1.27mm. 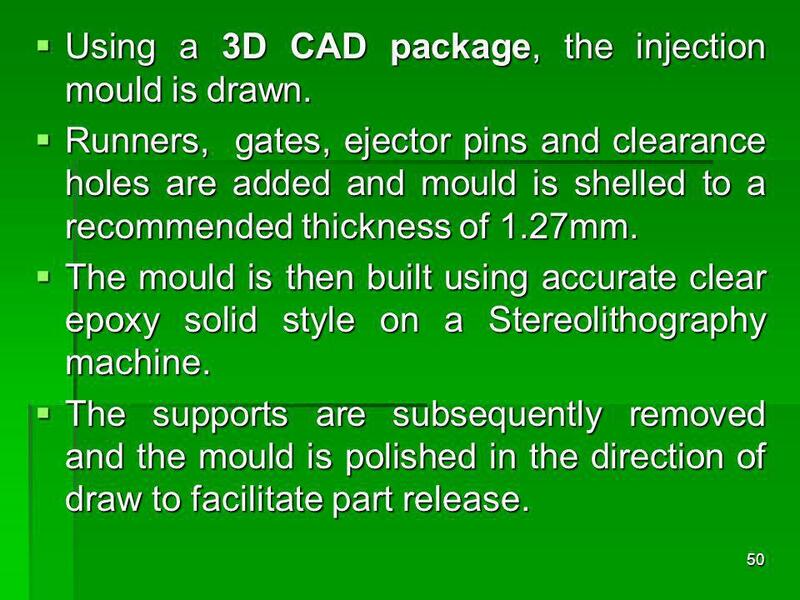 The mould is then built using accurate clear epoxy solid style on a Stereolithography machine. The supports are subsequently removed and the mould is polished in the direction of draw to facilitate part release. 52 To remove the maximum amount of heat from the tool and reduce the injection moulding cycle time, copper water cooling lines are added and the back of the mould is filled with a mixture made up of 30% by volume of aluminum granulate and 70% of epoxy resin. 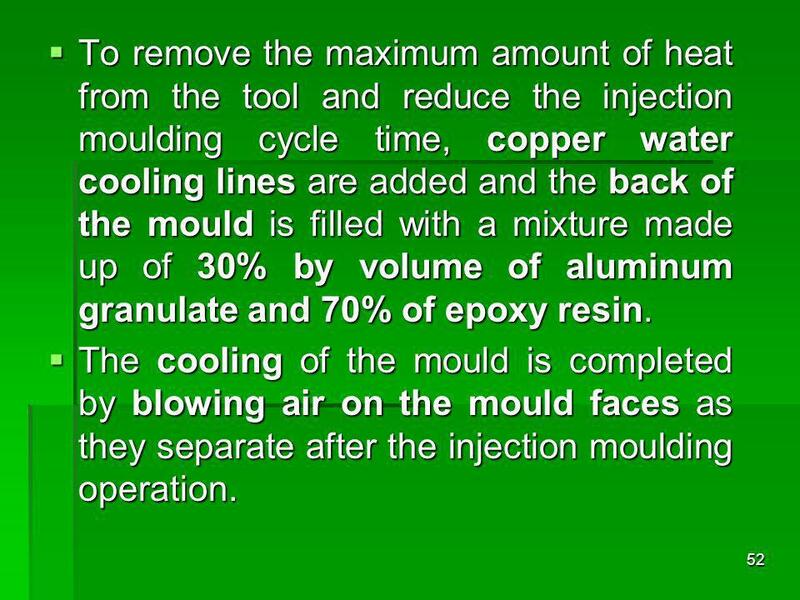 The cooling of the mould is completed by blowing air on the mould faces as they separate after the injection moulding operation. 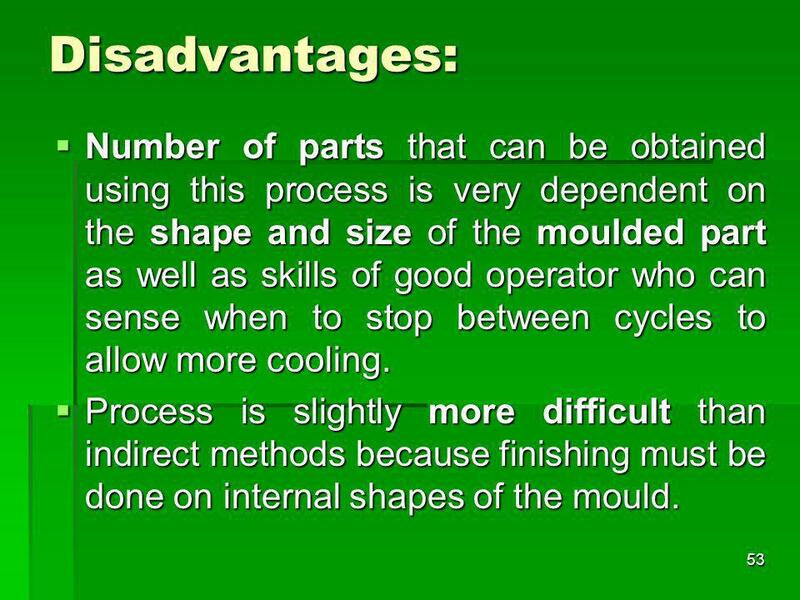 53 Disadvantages: Number of parts that can be obtained using this process is very dependent on the shape and size of the moulded part as well as skills of good operator who can sense when to stop between cycles to allow more cooling. Process is slightly more difficult than indirect methods because finishing must be done on internal shapes of the mould. 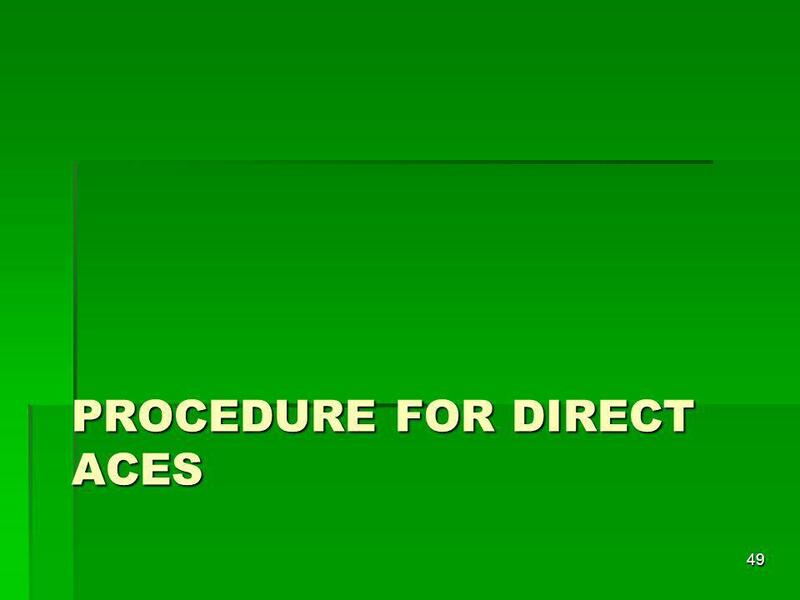 54 Also draft angles of order up to one and the application of the release agent in each injection cycle are required to ensure proper part injection. 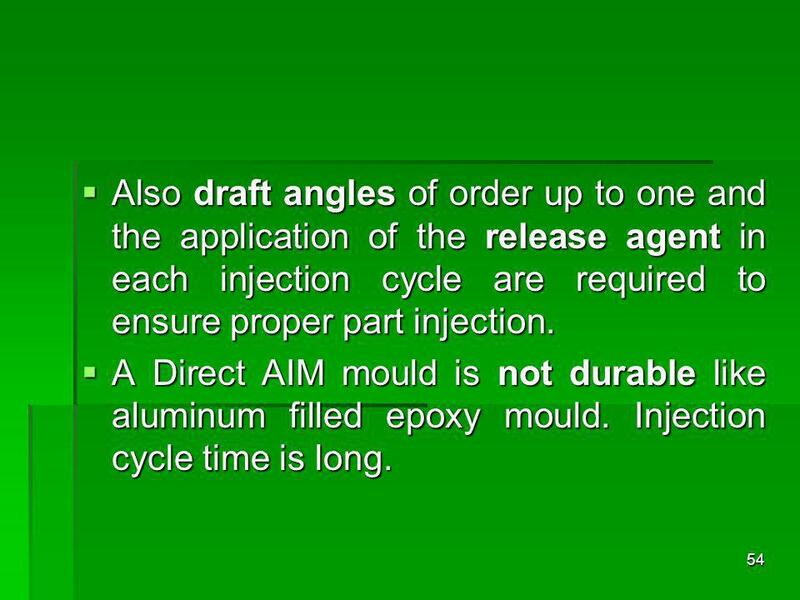 A Direct AIM mould is not durable like aluminum filled epoxy mould. Injection cycle time is long. 55 Advantages: It is suitable for moulding up to 100 parts. 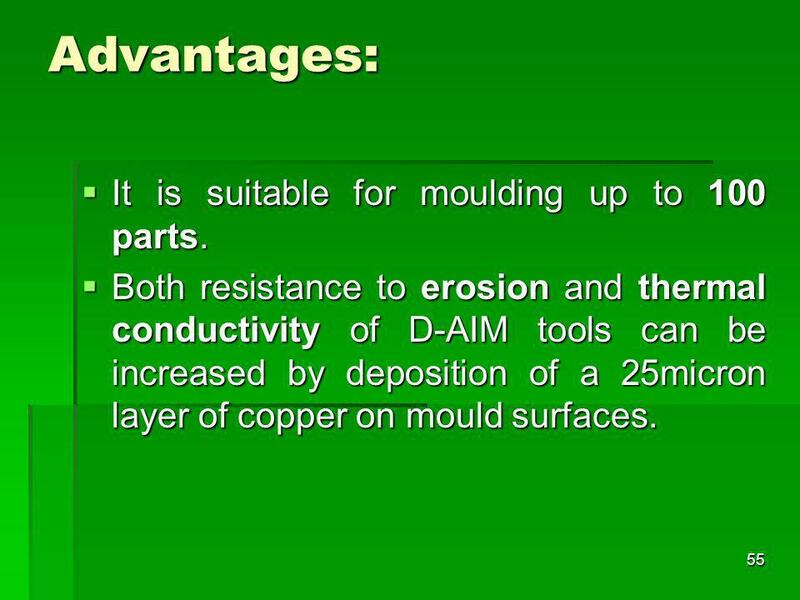 Both resistance to erosion and thermal conductivity of D-AIM tools can be increased by deposition of a 25micron layer of copper on mould surfaces. 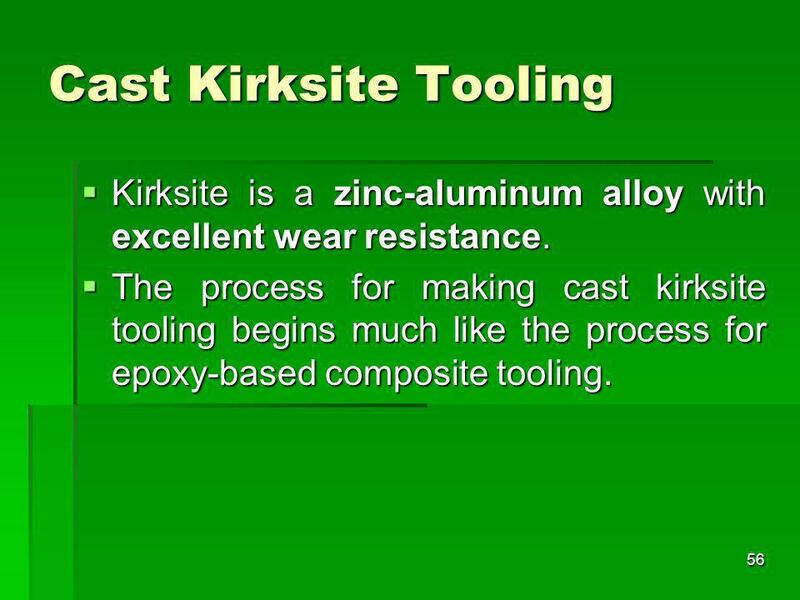 56 Cast Kirksite Tooling Kirksite is a zinc-aluminum alloy with excellent wear resistance. 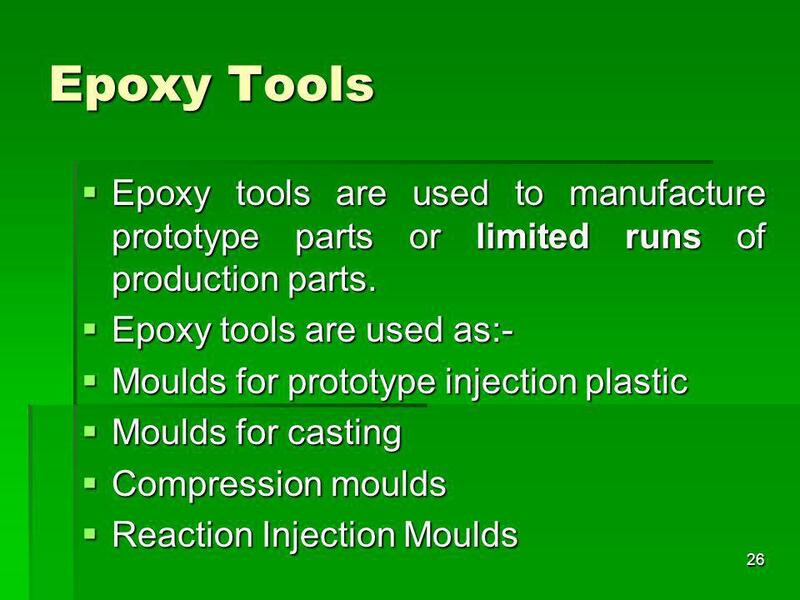 The process for making cast kirksite tooling begins much like the process for epoxy-based composite tooling. 58 First, a shrink-compensated master pattern of the part is produced, typically using an RP process. A rubber or urethane material is then cast against the part master to create patterns for the core and cavity set, which will be cast in kirksite. 59 Plaster is then cast against the core and cavity patterns to create molds into which the kirksite is cast. 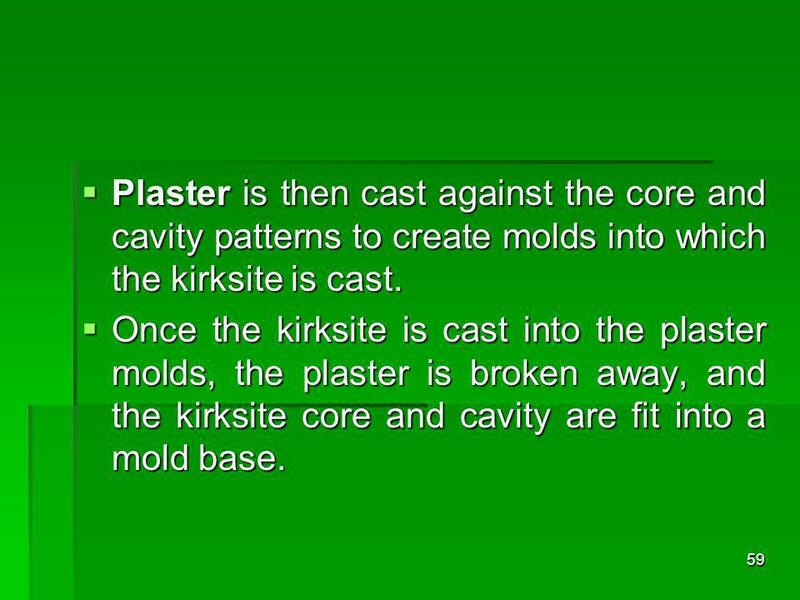 Once the kirksite is cast into the plaster molds, the plaster is broken away, and the kirksite core and cavity are fit into a mold base. 60 Life of cast kirksite Tooling varies from 50 to 1000 pieces till 20,000 pieces. 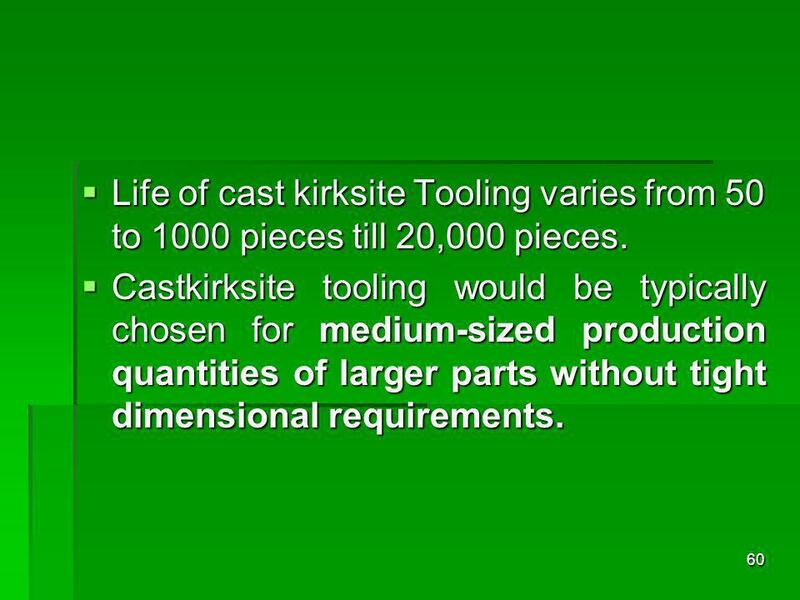 Castkirksite tooling would be typically chosen for medium-sized production quantities of larger parts without tight dimensional requirements. 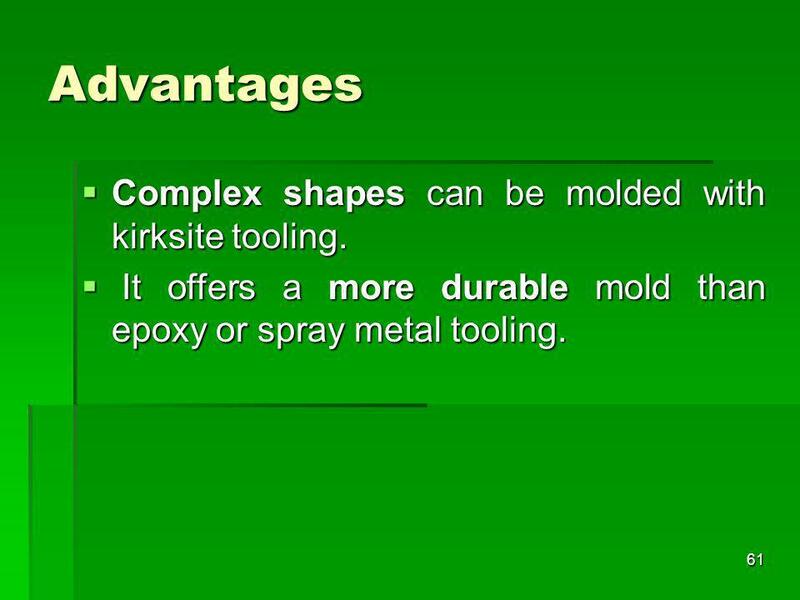 61 Advantages Complex shapes can be molded with kirksite tooling. It offers a more durable mold than epoxy or spray metal tooling. 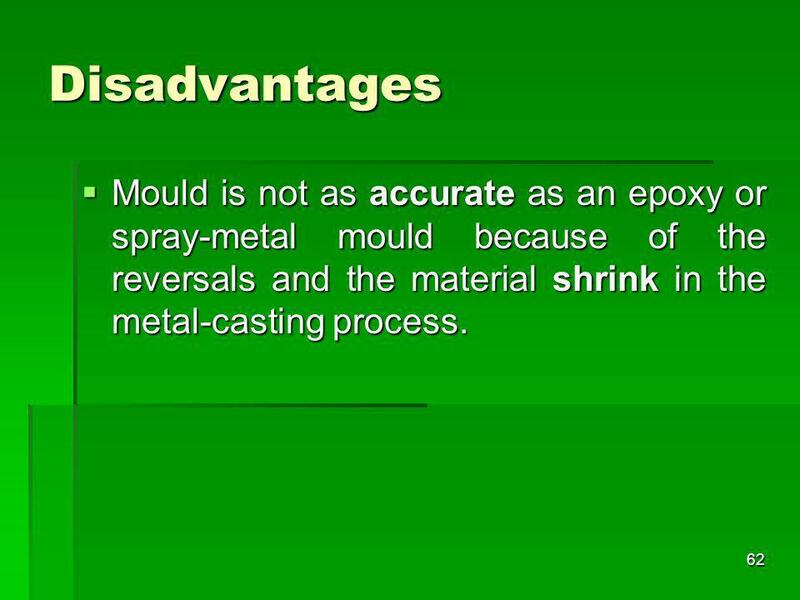 62 Disadvantages Mould is not as accurate as an epoxy or spray-metal mould because of the reversals and the material shrink in the metal-casting process. 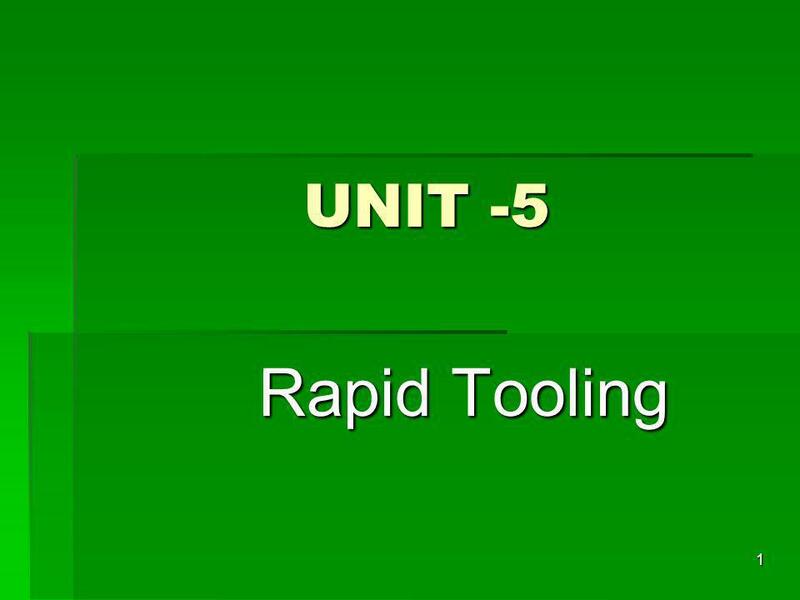 Download ppt "UNIT -5 Rapid Tooling." Introduction Composites have found their place in aerospace and in the sporting goods industry, where they have displaced many metal applications. The.